As we enter October, be on the lookout for new holiday updates and some exciting opportunities for the community! Please comment below for new clothing templates you would like to see in the next release! 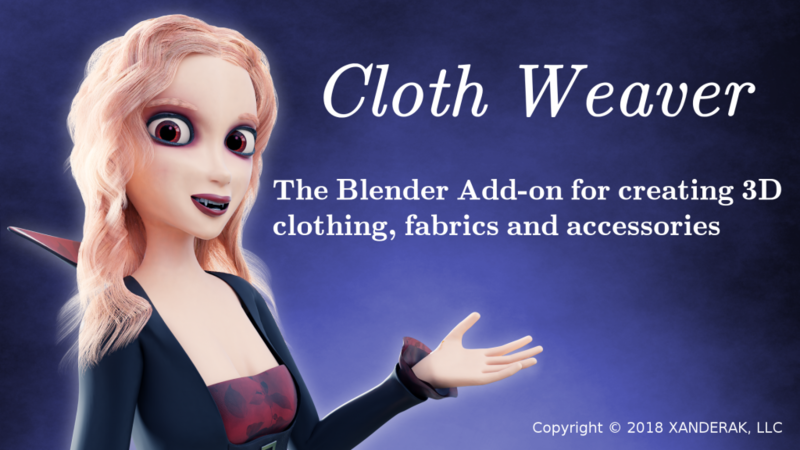 In the newest Cloth Weaver 4.3 update, we have removed the manual “odd|even procedure” that was used for designing custom clothes. We now have an intuitive system in place that streamlines user workflow! Here is a link to the latest v4.3 video tutorial with an entire workflow. If you are running v4.16+ you can update right within Blender! If you are running a previous version, you can log in to your Blender Market or Gumroad account and obtain the update there. Remember to remove the old version in user preferences before installing the latest when done manually. I would love to see more ‘fashion flat’ options. Basic clothing items like you already have that creators can adjust and add to. For example; different bodice options.